One indication for splenectomy is for diagnosis in an otherwise asymptomatic patient. Splenectomy may be needed to make a diagnosis when an asymptomatic mass lesion is seen within the spleen on CT scan, ultrasound, or MRI scan for which a definitive diagnosis cannot be made radiographically. Another example is when a patient has either a palpable spleen on physical examination or an enlarged spleen by scan, and otherwise has no clear diagnostic disorder. For the patients who have an isolated splenic mass, 60% turned out to be malignant lesions, 40% turned out to be benign lesions. Most malignant lesions are lymphoma; another large group is metastatic carcinomas, including some in which the primary diagnosis had not been made previously. In patients with benign lesions, more than half were cysts, and there were also splenic hamartomas and splenic hemangiomas. In diagnosing an isolated splenic mass, most of these lesions could have been diagnosed by doing an aspiration biopsy. Certain of these lesions—such as the cystic lesions or the hemangiomas—would have classic appearance on gadolinium-enhanced MRI scan, and these scans are another imaging modality that could be utilized to sort out mass lesions without tissue biopsy. Although there may be some hesitation to do fine-needle aspiration biopsies on splenic lesions due to the risk of bleeding, most mass lesions can be diagnosed with this minimally invasive technique. The risk of bleeding is significant in patients with hemangiomas. These benign tumors of endothelial cells can be definitively diagnosed with gadolinium-enhanced MRI, and this imaging test is optimal for characterizing an isolated splenic mass. The second diagnostic indication for splenectomy is unexplained splenomegaly. Most of these enlarged spleens will be shown to have lymphoma. The minority will have benign diagnoses including benign lymphoid proliferation, benign vascular lesions, and granulomatous disease, as well as splenic infarction and hemorrhage. The role of the fine-needle aspiration, other percutaneous biopsies for undiagnosed splenomegaly is quite limited; there would be very low yield in terms of being able to make that diagnosis by that form of biopsy. Another type of diagnostic procedure would be a staging laparotomy for Hodgkin’s disease. Discussion of this procedure is more of a historical note because it has limited use in today’s current practice in treating this form of lymphoma. A standard practice for pathologic staging between 1970 and 1990 was performance of a staging laparotomy in most patients with Hodgkin’s disease. 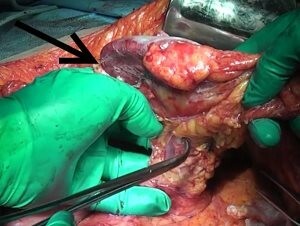 The reason for performing this invasive procedure was based on reports that laparotomy altered the clinical stage of disease in approximately 35% of patients. There are several reasons why the incidence of performing staging laparotomy has decreased over the past 10–15 years. The primary reason is that it does not alter treatment of Hodgkin’s disease based on results of recent clinical series. Since systemic chemotherapy treats the whole patient, accurate pathologic staging makes no impact on the treatment outcome or treatment decisions.